If you have been following my blog for some time, you know how much I love my templates! And of course I have a free downloadable template just for you! Just click the button below for your template. The free template is for use for personal cakes and for cakes you are selling. The only thing I ask is you don't take the template and use it as your own on another website ;). Print out your template in an appropriate size for your project. After you print out your template, cut out the elephant shape. Next, generously dust your workspace with cornstarch. Knead a little Tylose powder (use only a little dusting, we don't want it drying too fast) into your gray fondant to help it harden. 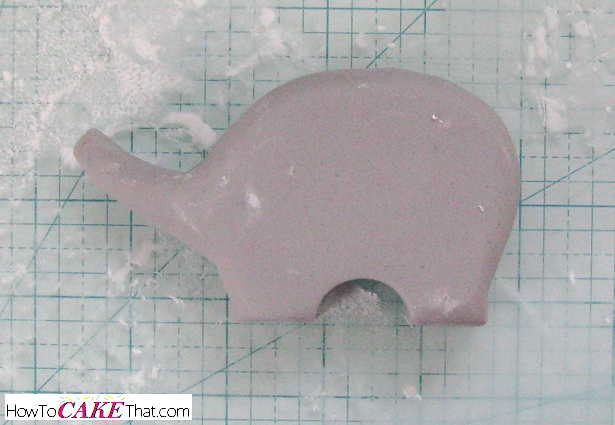 Place a large, thick piece of the fondant on the dusted area. 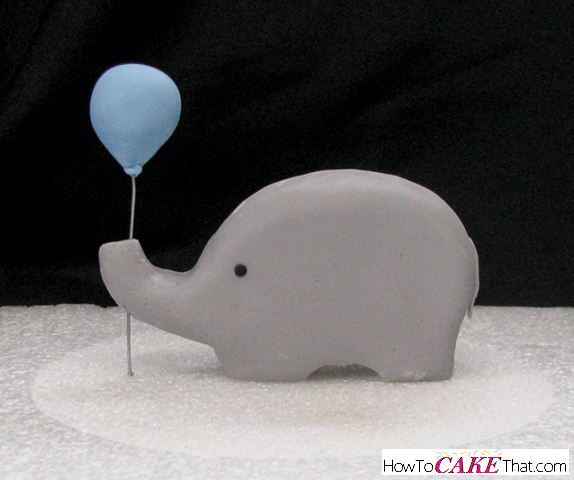 The thickness of your fondant will be how wide your elephant is. My fondant is about 1 inch thick. 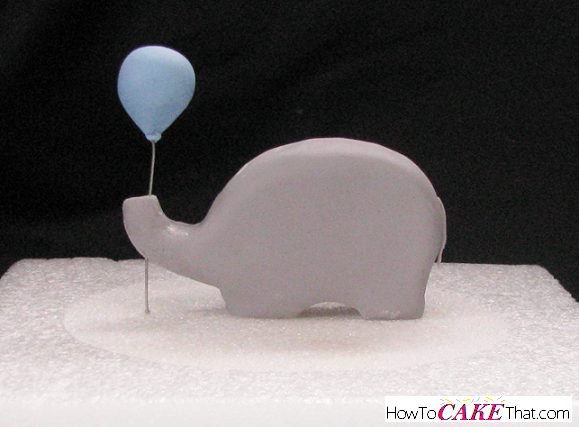 Be sure the sides of the fondant are smooth (no creases) - they will be the sides of the elephant. 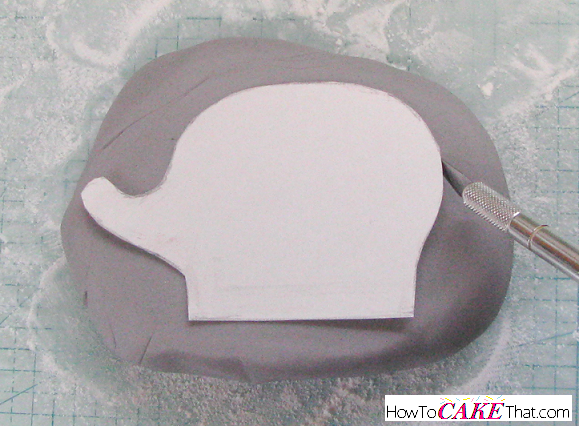 Place your fondant smoother on the gray fondant and press down with enough pressure to ensure the sides become perfectly flat. 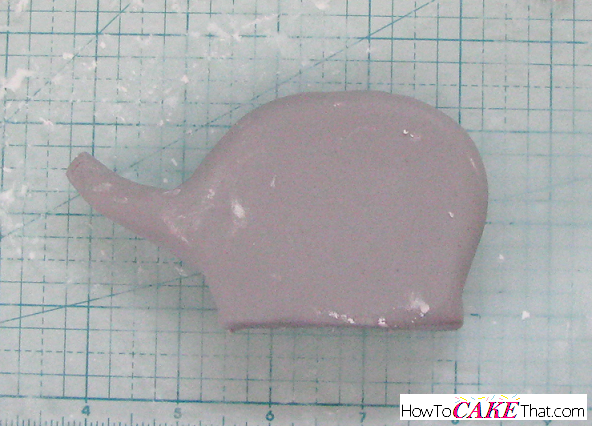 Be sure your fondant doesn't lose too much thickness or it won't be able to stand. 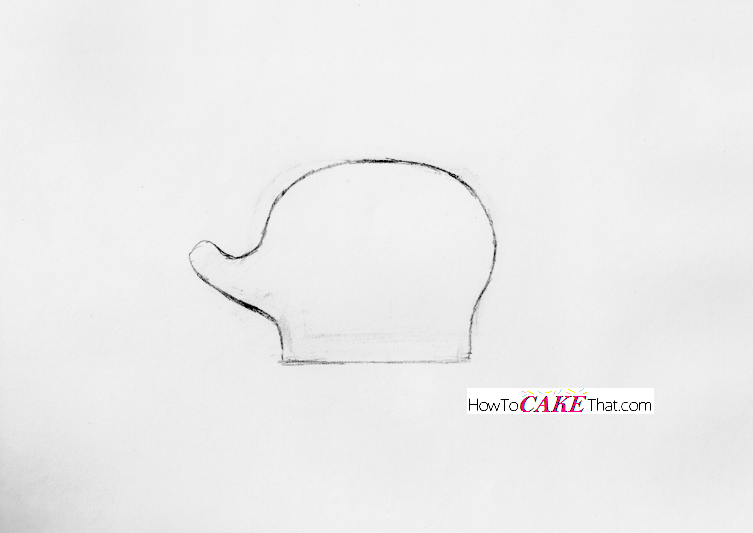 Next, place your template on the fondant and lightly trace around the template with an Xacto knife to leave a guide for trimming away the excess fondant. 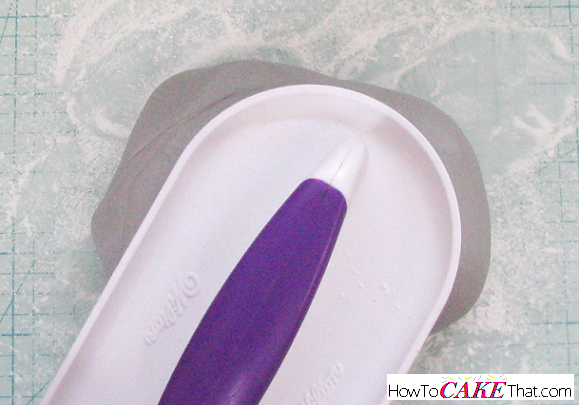 Remove the template and carefully trim away the excess fondant with a very sharp knife or razor blade. Be sure the trimmed areas are nice and smooth - not messy. If you're having trouble getting the edges smooth, dip your finger in a little water to get it damp, and lightly buff away any lines or creases. Next, using your fingers, shape the trunk to make it a little longer and skinnier. Trim away extra fondant, if needed. Use fingers to rub across edges all the way around the elephant (except where his feet are) to smooth them down and give the elephant a softer, more rounded appearance. 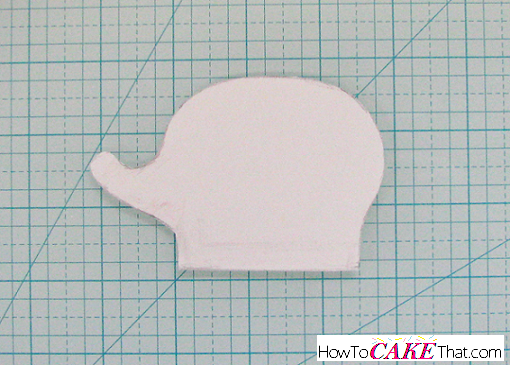 To give your elephant legs, use a small round cutter to cut away a half circle of fondant. Stand your elephant up and give him a cute little tail. To attach the tail, just brush a tiny bit of water onto the area where you'd want the tail to stick. Now it's time to make the balloon! 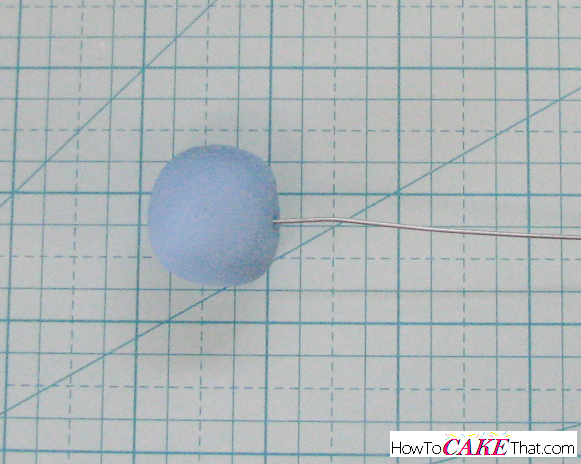 Using a heavy-gauge florist wire (I'm using 20 gauge), make a small loop on the end to give the fondant balloon something to hold on to. 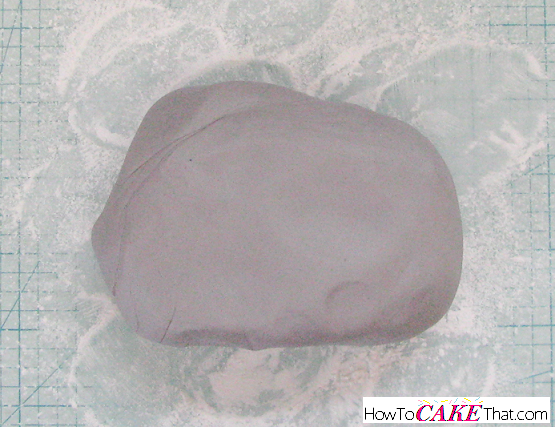 Roll a ball of fondant in the size needed for the balloon. Dip the loop of the florist wire into some water and shake off the excess. 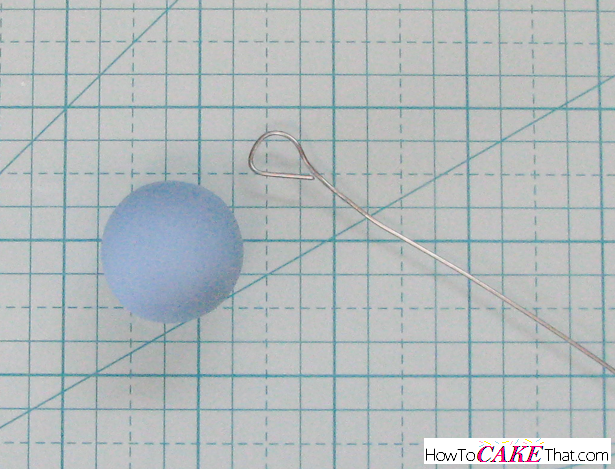 Insert the loop into the fondant ball. Now to give your balloon a realistic shape. Use your fingers to lightly pull the bottom part of the ball down to give it an upside down teardrop shape. Brush a tiny bit of water around the bottom of the balloon. 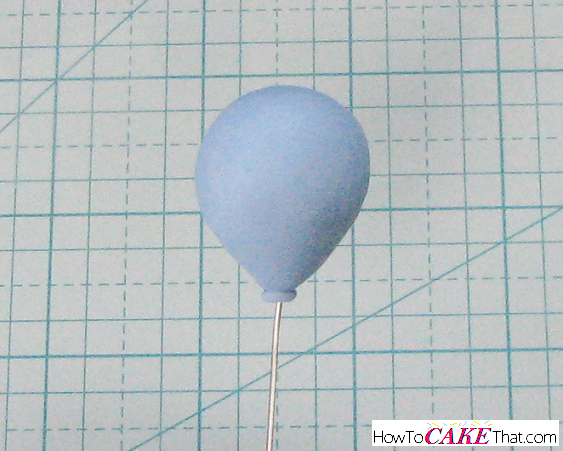 Roll out a tiny string of fondant and wrap around the bottom of the balloon. 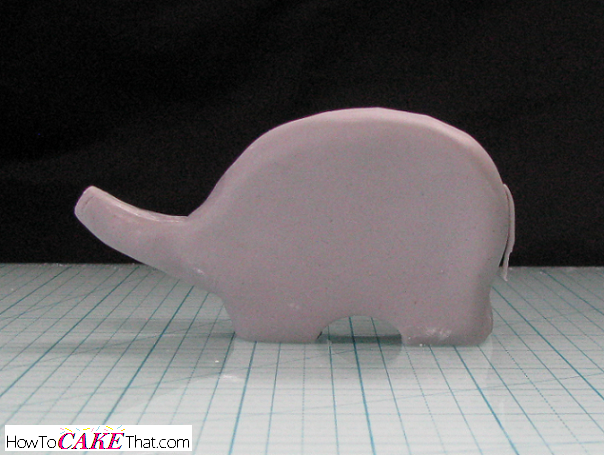 Set your fondant elephant on a block of Styrofoam. 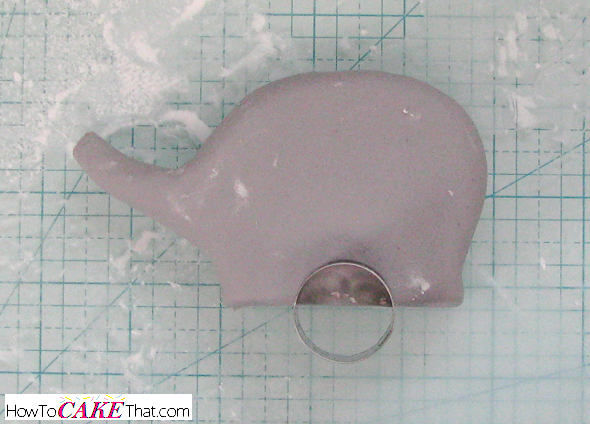 Insert the florist wire into the elephant's trunk and press the bottom piece of wire into the Styrofoam to give the trunk support while it dries. Using a small ball tool, mark and indent where the elephant's eyes will go. 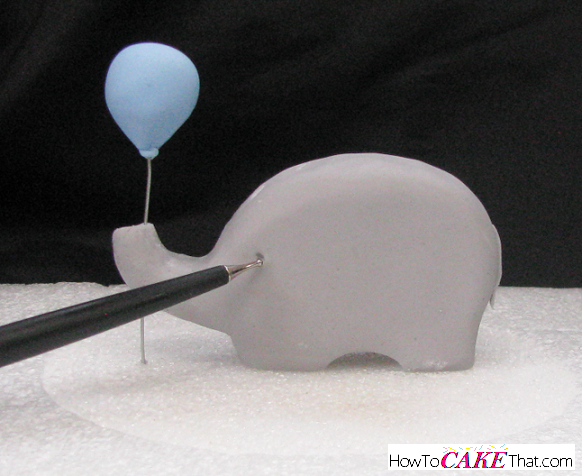 Brush the indent for the eye with a very tiny bit of water and fill in the indent with a tiny ball of black fondant. Using a heart cutter, eye up a good size for the elephant's ears. 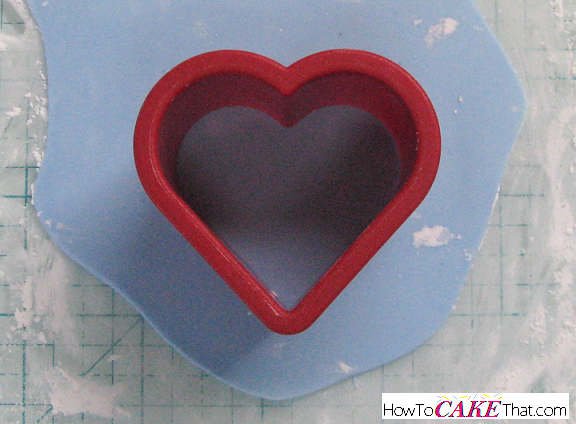 Roll out a thin sheet of fondant and cut out two hearts to use as ears. 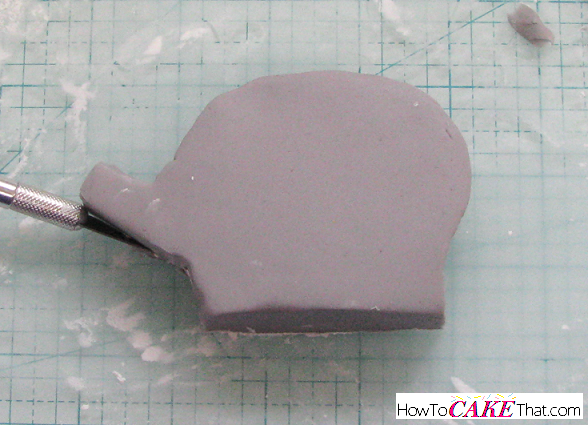 Attach heart ears by brushing a little water onto the backs of the ears and placing them on the elephant. Allow topper to dry at least overnight (but a couple of days would be best). 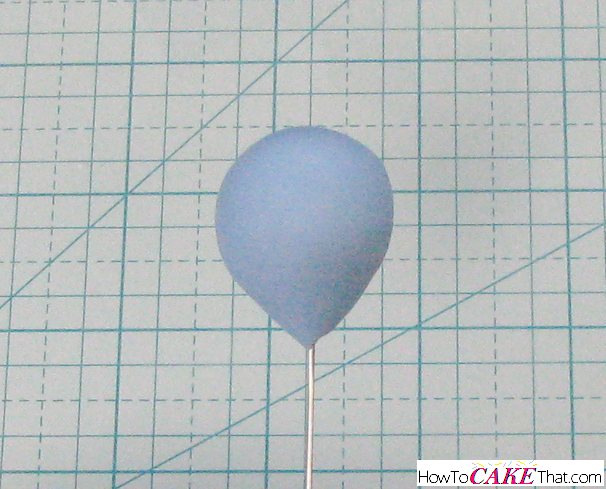 Once topper has dried, remove it from the Styrofoam and shape the bottom of the balloon's string. Trim string (wire) to size, if needed. 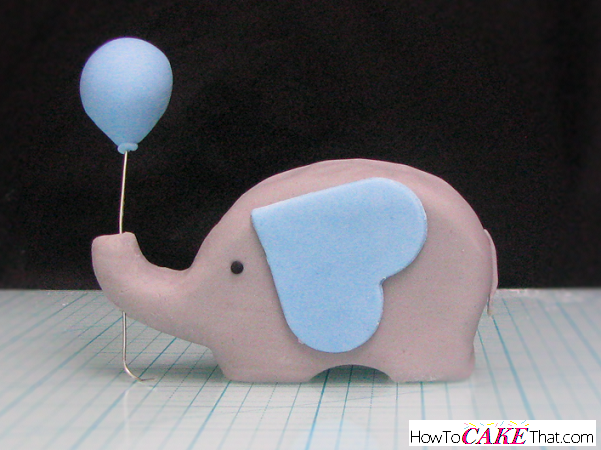 And that's how you make this super cute elephant holding a balloon baby shower topper! If you're planning on using this tutorial to make an elephant topper, I'd love to see your creations! I hope you have enjoyed this tutorial! God bless!